Over time I have found a number of dyspraxia stats and other facts that I thought would make a great addition to this site. While the facts aren’t as important as the condition itself I hope it makes for interesting reading. 2% of those 10% suffer with it severely. Dyspraxia is 4x more likely to occur in males than females, however recent studies show it’s more closer to 2 times. Professionals think that there is at least 1 Dyspraxic child in every classroom- whether they are diagnosed or not is another matter altogether. Which means that mathematically there is an 82% chance of it being passed down if both parents have dyspraxia. Dyspraxia is identified/picked up mostly between the ages of 7 and 10, however, due to the age of dyspraxia’s discovery some people in their 30s and above are only being diagnosed now. For the newer generations, we are lucky that dyspraxia has had a chance to become more known. Dyspraxia, in theory, has been known for about 100 years! Video games have been proven to help those with Dyspraxia! Click here for a page about it! 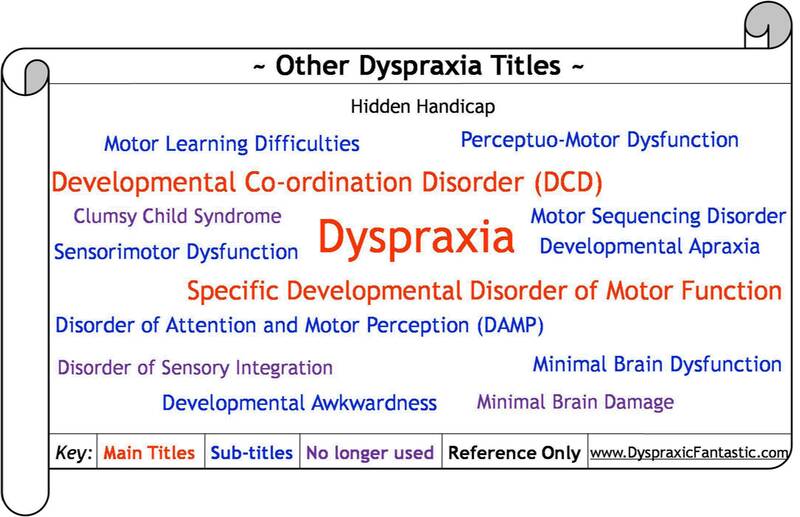 There are different names for Dyspraxia, some more used than others, some no longer in use (and for good reason!) and some for being slightly different definition to Dyspraxia, but very similar in practice. dys- meaning ‘difficulty’ and -praxis meaning ‘control of movement’. Developmental Co-ordination Disorder (DCD) – a subtly different condition by definition, in practice, very similar. It’s an acceptable name to use along with Dyspraxia. I wouldn’t normally post a comment on anything like this because I usually struggle with the stigma in my head. But I am an 18 year old girl and only found out that I had dyspraxia a couple of months ago. I have struggled a lot with getting a diagnoses for it because it was so unheard. It was always put down to dyslexic tendencies. The pasted 3 years after I have left high school I quit every course that I applied for because I knew that I was going to fail in some way. Although I stand by the fact that I am very intelligent with being sociable. I always have been told that I will never really amount to anything because I was deemed as ‘Lazy, stupid, rude’. This is not the case at all, I genuinely get intrested in a topic and when in a debate about it all I’ll get confused and really angry. Due to have been being dyspraxic being undiagnosed for a long time I think it has been linked in with my depression and anxiety. The harest part of dyspraxia for me is my speech, I stutter a lot and get my words muddled up even and I just get upset with myself. When I got told that I had it the women had a softened facial expression when she mentioned my dyslexia but as soon as I came up with dyspraxia I got written off completely. I have never met anyone else who has it, but I feel comfortable to truly explore, learn and embrace it. I am currently doing passing a mental health course with flying colours! I found that once I found all this information out that I looked at my course work completely different and I’m somewhat proud to have this in my dyspraxia. I found this facts page very interesting – Thank you! I’m glad you found the facts page interesting, and see that you have had a harsh start to life. I say keep up your amazing hard work and if you have any questions or help then I don’t mind answering or you can contact the Dyspraxia Foundation who will be able to give you support and guidance where needed! I’m so glad I found your site. My son(5) has a diagnosis of dyspraxia and I am trying to see how I can help him, ensure he gets the appropriate support at school etc. He is so funny, caring and warm, it’s great to see the positives of dyspraxia noted. He has always avoided any drawing/writing activity and lives for computer games (which are highly restricted at home, otherwise he wouldn’t do anything else), I was interested to see that video games can help with dyspraxia. That would be a win-win for us. Please could you let me know where you found this info so I can follow it up. If you have any quirky facts, figures or statistics then please feel free to post below!